17,000 tickets were sold on the opening day of sales for Anthony Joshua’s IBF World Heavyweight title defence against Eric Molina at the Manchester Arena on December 10, live on Sky Sports Box Office in the UK and on SHOWTIME in the US. Joshua defends his crown for the second time in his third fight in a row against American opposition – with limited tickets remaining on sale priced £40 to £500 from http://www.manchester-arena.com/ and on 0844 847 8000. VIP tickets are £800 and available exclusively from Matchroom Boxing www.matchroomboxing.com. Joshua’s clash with Molina tops a huge night of action in Manchester as Dillian Whyte faces bitter London rival Dereck Chisora in an official eliminator for the WBC title. Anthony Joshua is set to face off against heavyweight Eric Molina in the second defence of his IBF title in Manchester on December 10, and fight sponsors William Hill have unveiled their odds for the much anticipated showdown. Unsurprisingly the bookies have installed AJ as their 1/33 favourite to win the fight, Molina is 12/1 and the draw is on offer at 33/1. Joshua, (17-0-17 KO) will be gunning for his eighteenth consecutive knock-out victory – and he is rated a 1/10 chance for the stoppage. Fifteen of AJ’s KO’s have come in the first three rounds and he can be backed at 4/1 to win in Round 1, 7/2 in Round 2 and 4/1 to win in Round 3. The ‘Drummer Boy’ looks to be more durable than Joshua’s previous seventeen victims. 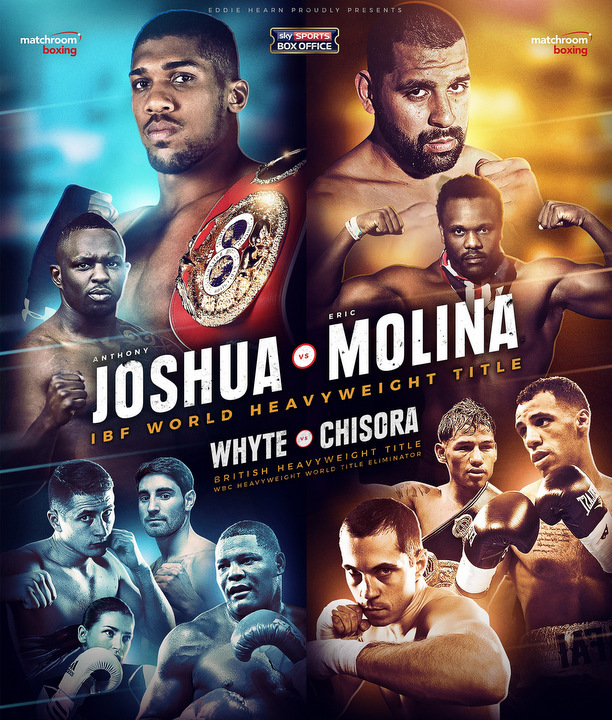 In his last five fights, Molina has gone 36 rounds out of a possible 44 – including a ninth round loss to the heavy handed WBC champion Deontay Wilder – and he’s rated a 6/1 chance to go the distance with Joshua. The big fight on the undercard is the grudge match between Dillian Whyte and Dereck Chisora. The pair have frequently clashed outside the ring and there’s clearly no love lost between the two heavyweights. Whyte, who’s only loss came against Joshua, is rated the 1/2 favourite to win the fight, Chisora is 13/8 and the draw is 25/1. William Hill spokesman Tony Kenny said “Anthony Joshua is on the fast track to becoming the biggest name in global boxing – and we’re delighted to be with him on his incredible journey. “Molina will be a decent test for Joshua – and post-fight it will be interesting to compare and contrast both Joshua’s and Wilder’s performances against the Mexican-American.